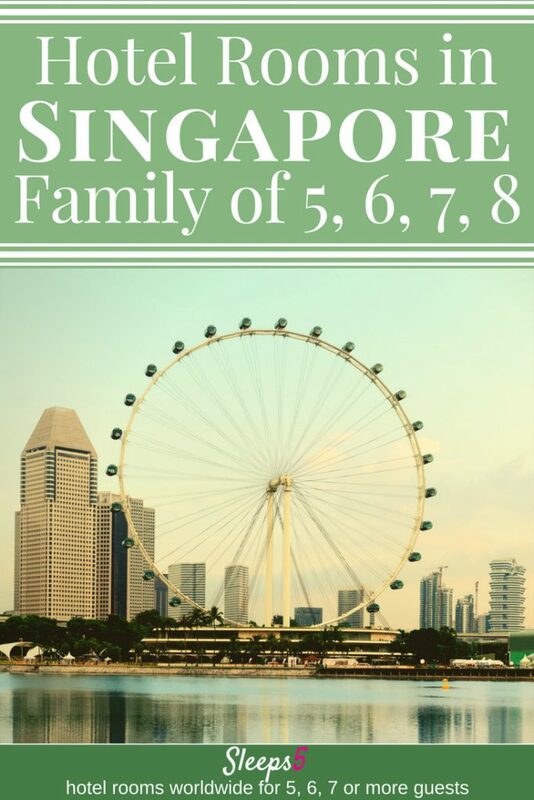 Options for Singapore accommodation for family of 5, 6 7, or 8 in one ‘family room’ or suite are listed in alphabetical order below (scroll down). The interactive Google map shows each hotel location. The room price or rate range of each hotel is indicated with the $ symbol. See the $-symbol key in the sidebar. Click on a hotel name for more details. The detail information includes a location street map, the hotel’s address, phone number, website link, email address, and how to book. Large hotel rooms, suites, and apartment hotels are included. Also listed is a hostel that can sleep up to 8 people. All have private bathrooms (ensuite) unless otherwise mentioned. There are King, Queen, and Single bed options. And some provide an extra bed, such as a roll-away bed, or a baby cot (crib). For every budget, you’ll find the best family accommodation Singapore has to offer. Check out the $ and $$ hotels if you’re looking for cheap hotels in Singapore for family. Or click on one with $$$$ or $$$$$ for a luxury family accommodation. Keep in mind that prices fluctuate quite a bit seasonally, or during events. Being a top destination to visit with kids and a big city, it isn’t easy to find the best family hotel. Singapore big family rooms do exist, though, and we hope the list below helps you find the ideal one for your family! If you find another hotel in Singapore for families that’s not already listed here, please email us or comment below! And let us know how your experience was, we love to hear from visitors! Singapore is a city, state, and an island to boot. It has a long and varied history leading to the country and society found today. The world has left its mark on this small but significant country through wars, settlement, colonial powers, human migration, and commerce. It is worth gaining a cursory knowledge of Singapore’s history before your visit. See Visit Singapore for more travel idea information. Lanson Place in Singapore offers high quality serviced apartments that we’ve used with the kids several times. Location is great, very close to Somerset MRT. Staff really helpful and can arrange a grocery delivery before arrival so the fridge is fully stocked. Nice pool on the roof which tends to be quiet most of the week as most residents are out at work. They don’t have a 7 night minimum anymore and you can book via expedia. Thank you so much for notifying Sleeps5 about Lanson Place! We will add an entry about it to the Singapore page right away. Just tried to find the kids room option at Swiss Hotel Merchant Court but think they must have stopped doing it as no sign on their website. I just want to add that to get the Kids Room package, you need to request it along with interconnecting rooms, and it’s best to do that by contacting the hotel directly by email or phone. We’d love to know your experience about booking with the hotel. Hi, we were able to stay two adults three kids (5, 8, 11) in a double room room at Village hotel bugis! They had a policy that all kids slept for free in existing beds when we booked with booking.com. It wasn’t roomy but worked out fine, especially because of a bench where we could put one kid. They also had family rooms and small suites with one bedroom and a big fold out bed in the living room where all the kids could sleep (we changed for this after a few nights). Thank you so much for letting us know about Village Hotel Bugis! That the hotel has multiple options for a family of 5 is fantastic. I’ll get it added to our Singapore page of family friendly hotels right away.